A busy Remembrance weekend saw the band perform at a special ‘Festival of Remembrance Concert’ on the Saturday evening, before leading the traditional parade on the Sunday morning. 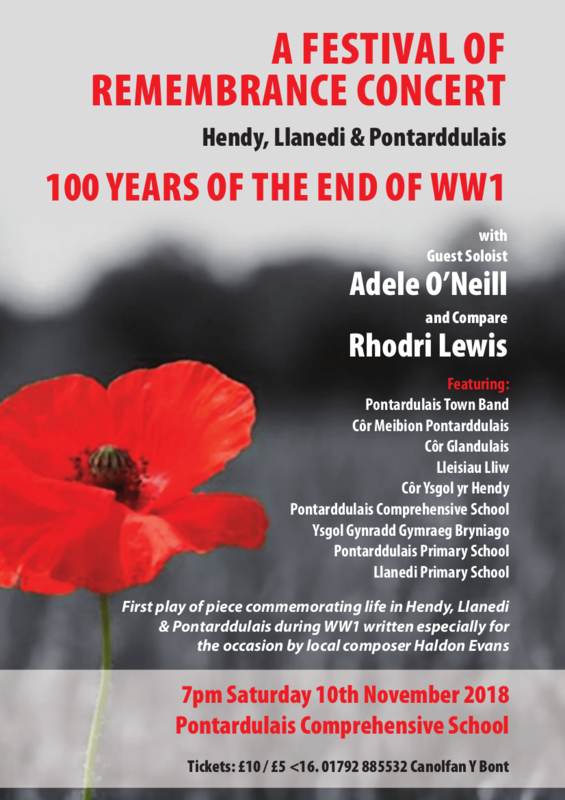 The concert, commemorating 100 years since the end of World War 1, saw the band give a world premiere performance of a composition written for the band, ‘Bugles Sang’, from the pen of local composer and current composer in residence of the Pontardulais Town Band, Mr. Haldon Evans. Also performing at the concert were soprano soloist Adele O’Neill, local choirs Côr Glandulais and Lleisiau Lliw, and the prize-winning Pontarddulais Male Choir. A number of performances were given by local children – choirs from Pontarddulais Primary School and Ysgol Llanedi, a choir and saxophone ensemble from Pontarddulais Comprehensive School and a dramatic presentation by Ysgol Gymraeg Bryniago. The concert was held at Pontarddulais Comprehensive School and was compèred by Rhodri Lewis. Llanelli online were present at the concert and have a report, along with photographs, available on their website. Popular brass band website 4barsrest.com also have a report on their website, specifically about the premiere of ‘Bugles Sang’.